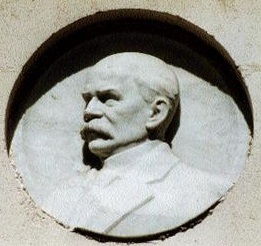 On the second of September in 1914, the mayor of Senlis, France, was shot by the occupying Germans in the opening weeks of World War I. 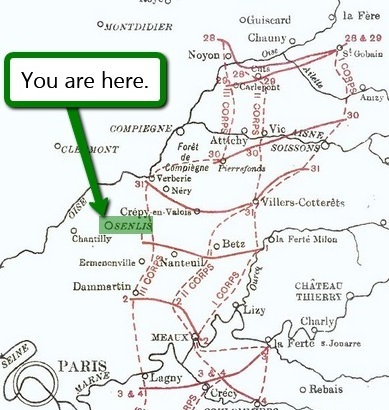 Detail view (click for the full image) of a map of the British Expeditionary Force’s retreat in northern France during the first days of World War I. The beautiful ancient town, where the Carolingian dynasty met its end (King Louis V was killed in a hunting accident there in 987, enabling Hugh Capet to take the throne), unhappily found right in the path of the German army smashing its way towards Paris as France and her allies gave way. 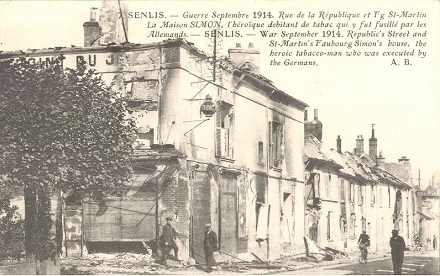 German troops reached Senlis by the first of September, and overwhelmed the city in a minor battle. 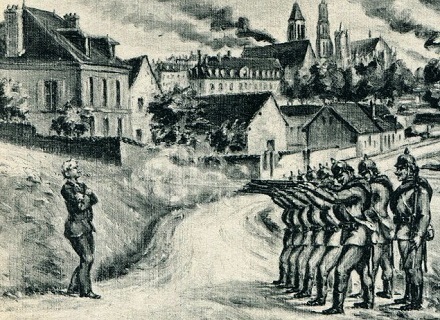 On guard from the experience of being picked off by franc-tireur snipers during the Franco-Prussian War many years before, the Germans entered this urban skirmish with far more concern for the safety of their troops than for that of noncombatants. A number of civilians were seized for use as human shields by the Germans as they moved through the streets, and some others reportedly executed summarily. Numerous buildings were torched. 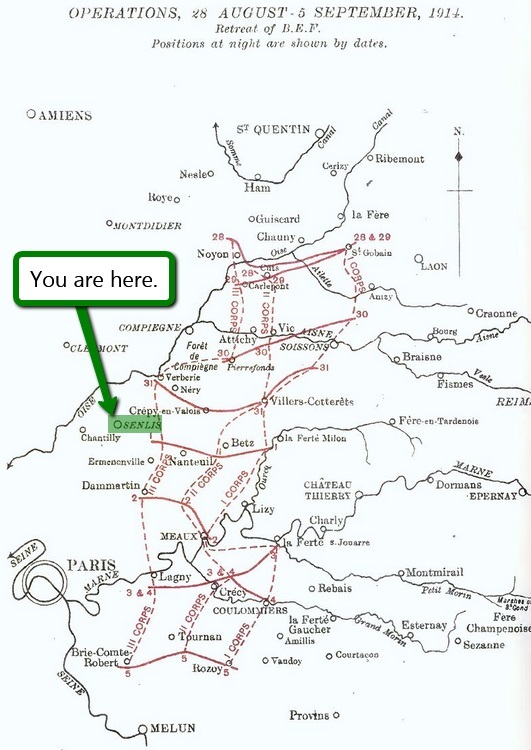 The stunning German attack seemed on the brink of capturing Paris at this point, but just days later the disordered French “miraculously” — it’s literally known as the Miracle of the Marne — threw the invaders back at the Battle of the Marne. This battle crushed Berlin’s dream of a knockout victory and allowed the combatants to settle in for four bloody years of miserable trench warfare. 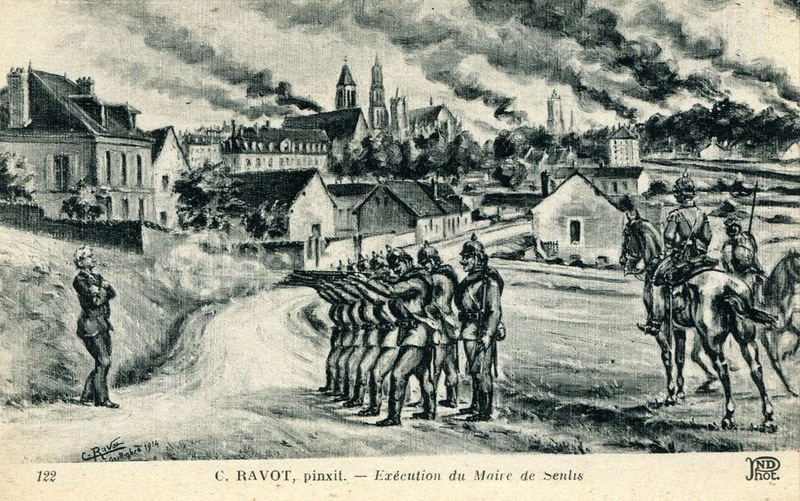 It also enabled the French to recapture Senlis, whose horrors — Eugene Odent and all — were collected for early entry into the war’s annals of barbaric-Hun propaganda.